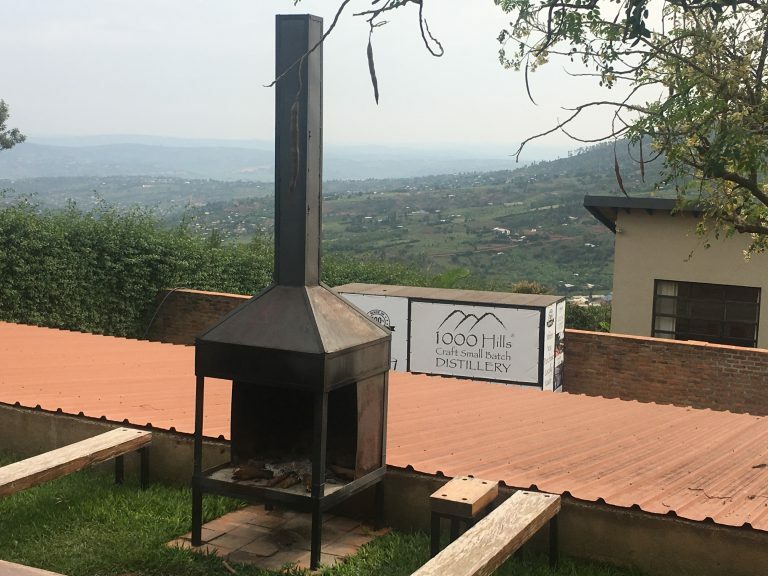 I enjoy a nice cocktail every now and then, and during my recent visit to Rwanda I was lucky enough to be hosted on a private tour of 1000 Hills Distillery, the first craft small batch distillery in East Africa. 1000 Hills is located in Gatenga, about 20 minutes from downtown Kigali, and boasts spectacular panoramic views of the Kigali hillside. Its grounds also include a Cocktail Bar and Bistro aptly named The Distillery. My tour was conducted by the managing director, Andrew Herweg, who was very knowledgeable and enthusiastic about the operation. 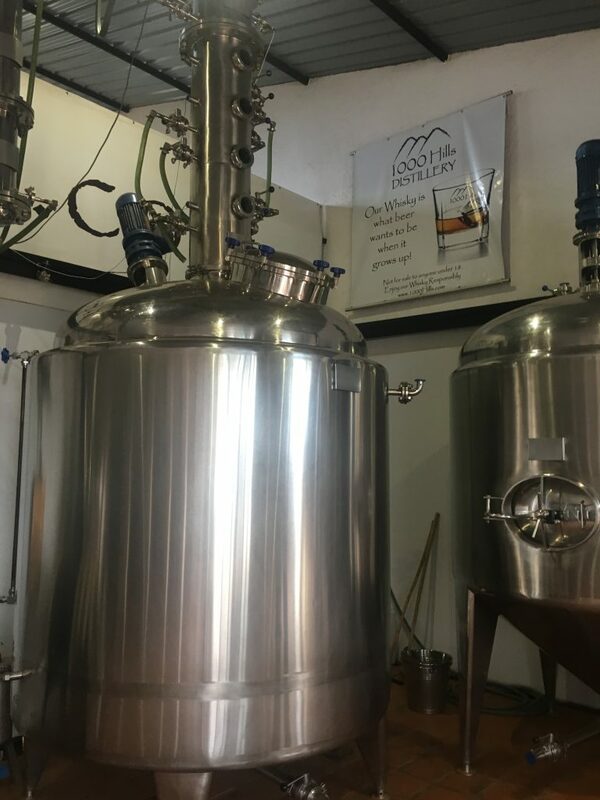 He started with an overview of the distillery’s founding and guiding principles, then explained the machinery, the distillation process, and the current and future planned products. I was especially impressed with their social impact and eco-friendly focus. From start to finish, they mesh their business operation with green principles and community engagement. They use harvested rainwater which undergoes a 15-stage filtration process. Their sugar cane is sourced from a local village, supporting nearby micro and small businesses. The by-products created during the distillation process are supplied to the Rwandan government and local communities to make mosquito repellent, fertilizer and other farming products. And the food served in their Bistro is sourced from local farmers. After the tour, it was time to taste the final product. I tasted each of their five triple distilled liquors: London Dry Gin, Vodka, Coffee Liquor, 3-year aged Malt Whiskey, and Light Spiced Rum. 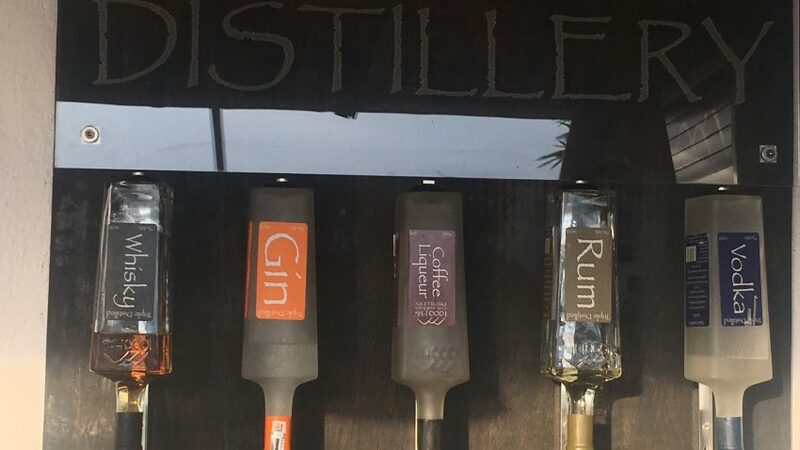 Not surprisingly, my favorite was the Coffee Liquor, which was smooth with the perfect mix of coffee and rum (I’m typically not a whiskey drinker, but surprisingly it was my second favorite). Coffee is a major crop in Rwanda, so of course, their coffee beans are sourced from a local women’s coffee cooperative. After the tasting, I ate lunch at the Bistro – chicken tacos served with salad and fries and one of their signature drinks, the Singapore Sling made with 1000 Hills Dry Gin. Everything was fresh and tasty. 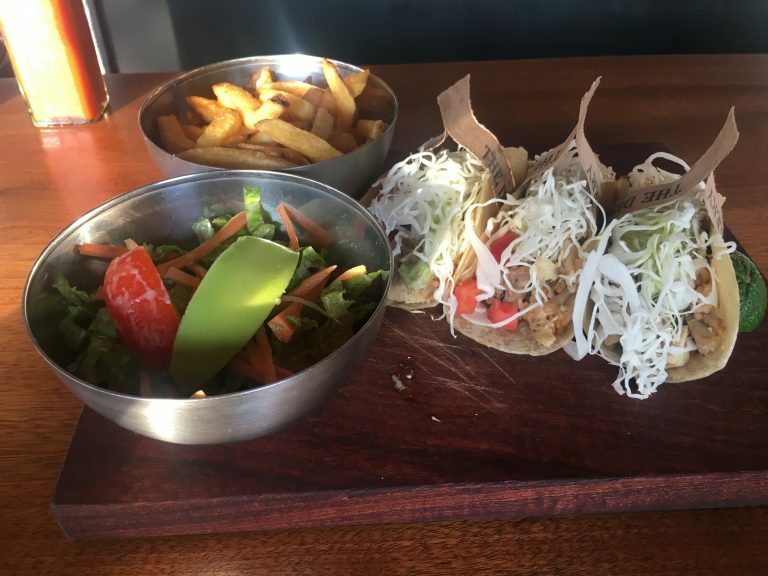 The food menu is limited but there are several taco, satay and steak options. Though I didn’t try it, I’m told their signature steak, cooked on a hot rock, is one of Kigali’s most popular dishes. The drink menu is more extensive, with 16 signature cocktails all made with their liquors. 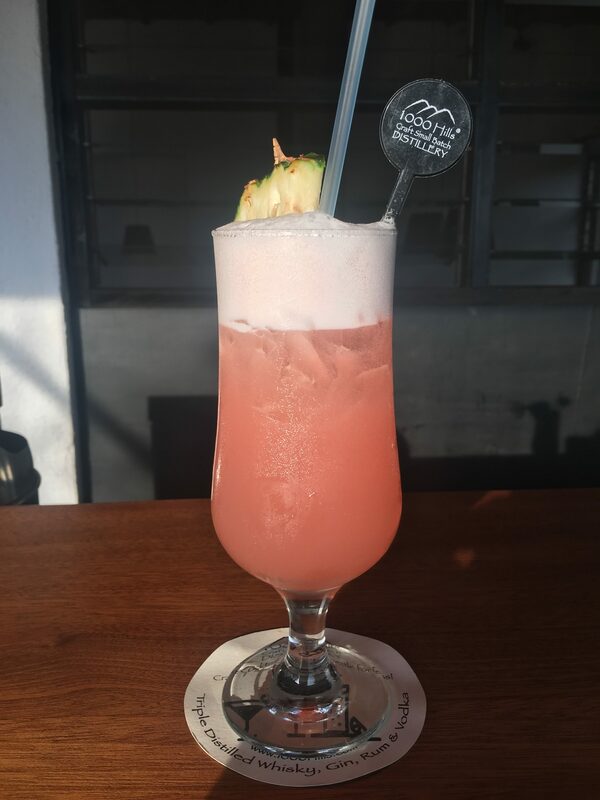 With stunning views, delicious cocktails, tasty meals and a socially conscious ethos, this place is not to be missed on a visit to Rwanda. To learn more about 1000 Hills, visit them on Facebook or Instagram. 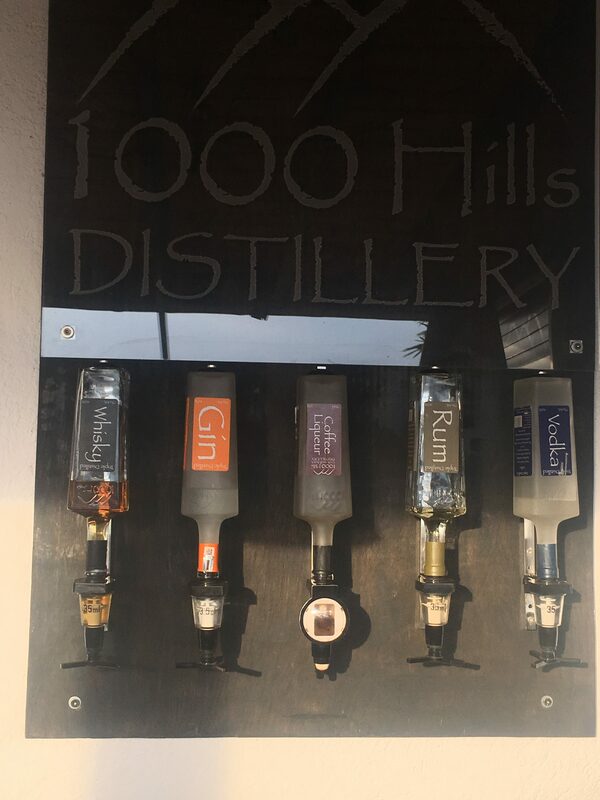 Tours and tastings can be booked online at the 1000 Hills website. They also sell their liquors, merchandise, and liquor-infused coffee beans on their website. 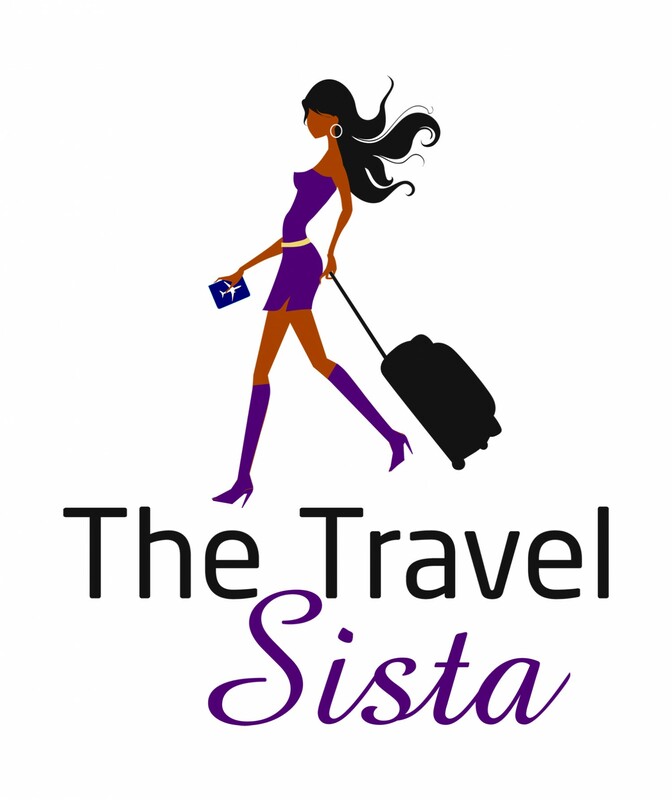 ** I received a free tour and tasting in exchange for this review. All opinions are honest and my own.